Petra is one of those places that either elicits a blank stare or complete excitement when I tell people I want to come here. So I learned from my young cousin to explain to the former in this way: Have you ever seen Indiana Jones and the Last Crusade? Well, Petra is the real place that houses the building where the holy grail is found in that movie. So yeah Indy and I go way back and I am excited to follow his footsteps to the Lost City of Petra! I’m an early riser in general but I’ve learned that it really pays off to get to really popular places first thing in the morning. Many times I’ll be the only person there and this was almost true for Petra with only a handful of people present. BR The sun is starting to rise as I am midway through my walk from the entrance into Petra. Note: You will be offered “free horse ride” and then told that the tip is 18 Jordanian Dinars or over $25 USD for a 5-10 minute ride. This is no faster than walking and the walk is beautiful and easy. TL: The Nabataeans were the ancient Arabs that built Petra (their capital city) and one of the first buildings you will see is Bab al Siq: Arabic for entrance to the Siq. TR: The Siq ~ it’s this long, winding canyon made up of colorful sandstone that’s 80 M high in certain places and 3-12 M in width that is stunning in its own right. Here you will have your first glimpse of Petra and the Treasury. BL: It doesn’t matter how much you have seen or read about Petra, nothing can prepare you for seeing it in person. 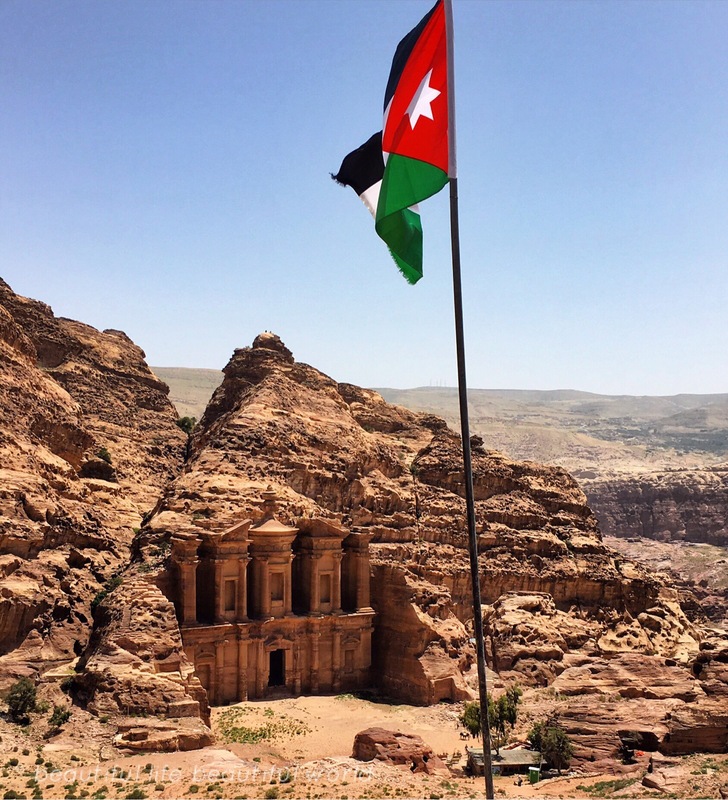 There’s a reason why it’s Jordan’s most popular tourist destination and one of the 7 New Wonders of the World. This is the jaw dropping facade of the Treasury. The vast majority of people will head now to the Street of Facades but if you’re in good health, have a good sense of direction, want to see all of Petra, I would suggest you take the less popular route. When you are looking directly at the Treasury, MR there are stairs to your left and will lead you to TR the high place of sacrifice. It’s a large cult area that offers some stunning views (TL, BL) with a sense of tranquility since you will likely be the only one there. I only encounter the local Wadi Musa people heading to open their shops and BR had one man point out the cairns to me. He was worried that I would get lost but I assured him that that I was fine as I can read a map and have a really good sense of direction. It would be more accurate to say I felt at home ~ hiking surrounded by red colored rocks. Some of the locations that you will see going this markedly less popular route include The Colored Triclinium, The Soldier Tomb and The Renaissance Tomb. Note: You should come prepared with sunscreen and lots of water! I carried in 4 liters of water and still ended up buying another two on this day with the soaring temps and the arid environment. I also packed a lot of snacks and lunch. You will notice how crowded TL the Streets of Facades and BL the Theater are! It is absolutely fascinating to me how an ancient civilization could create such large monuments as the people in the picture help provide some scale. These buildings were literally carved in the sandstone cliff faces! An impulsive decision to come to Jordan because I wanted to see Petra and well it was meant to be as TR this sign suggest. I love also how we are still learning so much more about Petra ~ I read on National Geographic that only 15% of it has been explored and in early summer 2016 it was published that a massive new monument was discovered using drones and satellites. 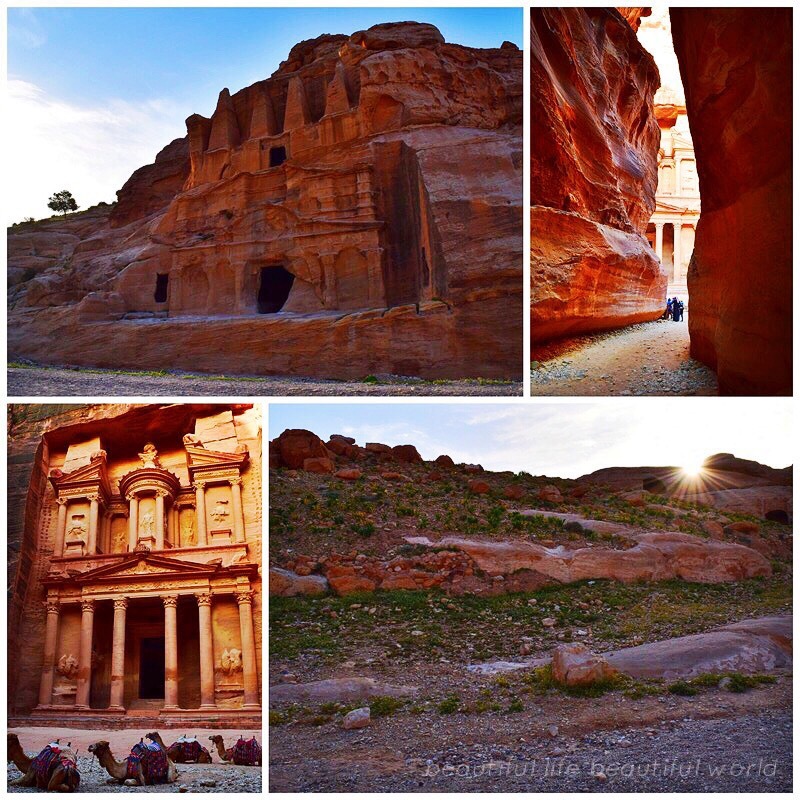 The Monastery is the largest carved monument in Petra and to see it requires walking more than 800 steps. You can hire a camel and was told it would cut the time in half to reach the top. I prefer walking and it took me a little over 30 minutes but I’m also a really fast hiker. I decided to continue hiking up as was rewarded with this view looking down at the monument. 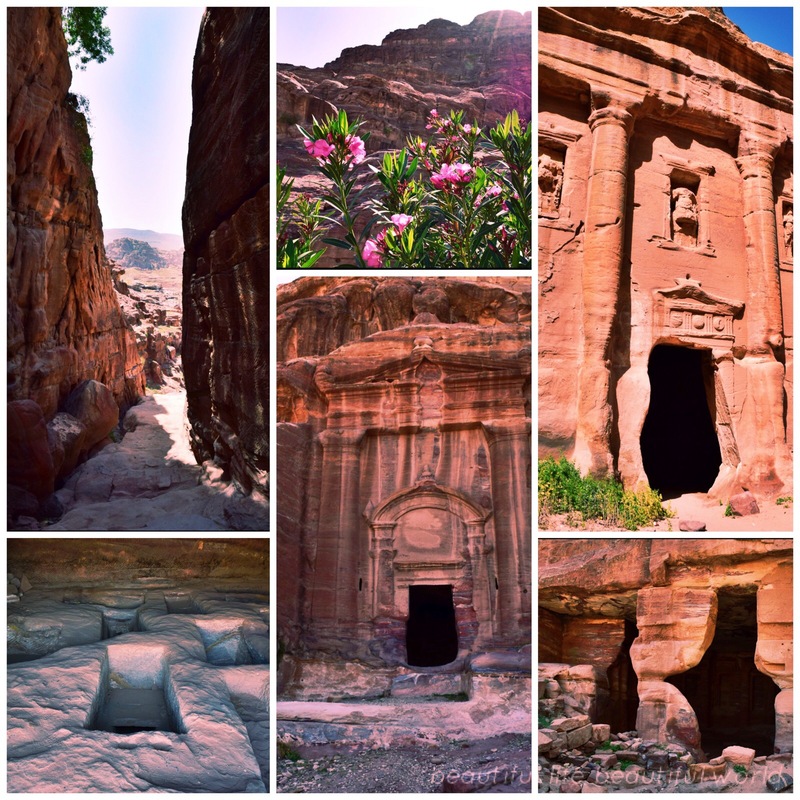 I had purchased the Jordan pass allowing me access to Petra for two days as I wanted to explore the entire area. I’m pretty fit so it would have been manageable to see everything in one day starting at 6:00 and ending at 18:00 but that would have left little time to enjoy and explore in depth. I was in Petra the first day from open to close and the second day from 7:00 to about 13:30 and managed my time and routes so I could enjoy most of it crowd free. For example, the second day I headed straight to the Royal Tombs off the Streets of Facades and was the only one there. Petra at Night: Not my finest moment with my now infamous lack of planning ~ I came on a Friday night to Petra and this only happens on Monday, Wednesday and Thursday at 20:30 and does require a separate ticket (17 JD). Basically it’s the walk up to the Treasury lit up with candles ~ I’ve heard mixed reviews myself but still something that I want to do on a return trip to Petra. I will pass on the advice that if you are going to do this that it’s best to do it prior to visiting Petra during the day. Border crossing(s): If you’re interested in continuing onto Israel you have three choices. Down South you can cross from Aqaba into Eilat. I originally was going to go up North over the Jordan River Border and was able to book directly with Abraham Tours a transfer between Amman and Nazareth. I ended up missing the bus but it all works out as my friends decided to join me for a crossing the next day. So I ended up then crossing at Allenby/King Hussein Bridge which is the closest to both Jerusalem and Amman. My hostel (Jordan Tower Hotel) helped us book a taxi and I would suggest going as early as possible. We have heard that this is the toughest way to get into Israel in terms of border control but we actually had the most trouble on the Jordanian side. That border was closed and no one could tell us why and if/when it would reopen. This is when the privileges afforded to being a Westerner traveler became apparent as we were escorted to a special waiting area and were the first to cross when the border did reopen. Note: you will have to pay an exit tax of 10 JD and will leave your passport with the agents at the window and board a bus. Once the agents are finished processing the passports, they will bring them onboard and distribute. Additionally there is a 7.5 JD fee for the bus (plus additional 1.5 JD fee for each bag that is put under the bus) that takes you to the Israeli border. 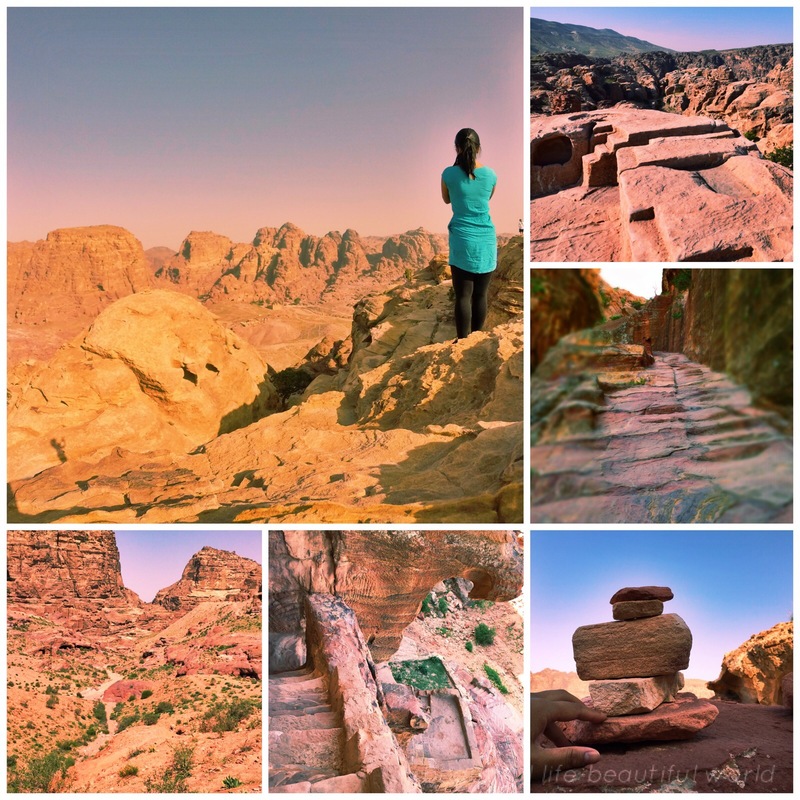 Many people have asked me about the safety aspect of traveling as a solo woman through Jordan and I struggle with how to answer this. I love Jordan and it is such a beautiful country with so many incredible things to see and do. I was aware that harassment would possibly be an issue but was advised that it would be verbal. I’ve experienced harassment in almost every country I have visited and at home (so 48 out of 50 countries) and I can definitively say that Jordan is not the worst. But in addition to verbal harassment, I was constantly touched and stroked and had a few disturbing things happen during my time there. HOWEVER I have met a fair number of solo female travelers that have been to Jordan and none experienced the physical harassment that I did so please take that into account. I do tend to have very unusual and extreme situations happen to me so that also may account for some of it. But the hardest part of Jordan for me was the almost complete lack of interaction with locals (both with men or women) and that was such a disappointment for me. I was able to make a few Jordanian friends one night in Wadi Rum and would love to come back and visit them ~ so yes, I would still go back to Jordan now. Nice & really an informative post you have shared here about Jordan. Really Jordan is a best & unique place in earth to visit & everyone have to make a trip to Jordan. Thanks to Mantis Tours that I have already returned from there. Every letter & every word which you placed here to describe Jordan bitterly is really true & I am the eyewitness of Jordan beauty. Your pics are so clear & I have also the same pic which I had clicked on my Jordan trip. Everyone will mesmerize after visiting that place.